Ira S. Murfin is a doctoral candidate in the Interdisciplinary PhD program in Theatre & Drama at Northwestern University. He received a dissertation research fellowship from the Ransom Center to work in the Spalding Gray collection, investigating the early development of Gray’s influential autobiographical monologues for his dissertation on the use of talk as a performance strategy in the American avant-garde. The Ransom Center is celebrating the 25th anniversary of its fellowship program in 2014–2015. Spalding Gray sits in his loft in Lower Manhattan. It is 1979, and he has had a difficult few years after suffering an emotional breakdown while touring with The Performance Group’s production of Mother Courage and Her Children to India in 1976. He turns on his tape recorder and relates everything he can remember about what happened then and what has happened since. That summer he is a visiting artist at Connecticut College, and he tells these memories to an audience for the first time, interspersing excerpts of Virginia Woolf’s To the Lighthouse, which he had been reading when things started to go bad for him in Kashmir. By that fall, back at The Performing Garage, his home theater in New York, the piece has acquired the name India and After (America) and a second performer who reads definitions from a dictionary at random, which Gray associates on the spot with anecdotes that he tries to tell within a given time limit. The Woolf excerpts have been cut, and the seemingly random associations of memory have been approximated by chance procedure. This structure keeps the piece in the present, even as it recounts the past. The audio and video documentation in the Spalding Gray collection at the Harry Ransom Center, where I was able to spend a month earlier this year thanks to a Ransom Center dissertation research fellowship, enabled me to track early Gray performances like this one in their developmental process. Most people who know Gray from the successful 1987 film adaptation of his monologue Swimming to Cambodia have probably never heard of India and After (America), but this early example documents Gray establishing the practices he would continue to use and adapt for the rest of his career. This approach has come to define the elements of the autobiographical monologue and the first-person account as dramatic and literary genres. Arguably the most well-known autobiographical performer of recent decades, Gray is one of the central subjects of my dissertation project, Talk Performance: Re-Negotiating Genre, Embodied Language, and the Performative Turn in the American Avant-Garde, along with the poet David Antin and the dance artist Yvonne Rainer. In this project, I examine talk performance—direct address, non-fictional, apparently extemporaneous speech in art-specific contexts—as a strategy used by these key figures in the post-1960s American avant-garde to address shifting disciplinary expectations and the implications of recorded media for composition and circulation. Alongside the recordings of Gray’s earliest monologues available at the Ransom Center, I was able to track many of the events he discussed in his performances through the personal journals he was keeping at the time. Also, I was able to survey a number of efforts to turn material from his talk performances into publishable texts, variously cast as fiction, as personal essay, and finally as dramatic literature. I used this research to understand how Gray coordinated writing, live performance, and audio recording to develop and eventually set his monologues. Ultimately, this will help me to articulate the ways that Gray’s idiosyncratic experiment in public self-examination became a familiar and widely reproducible dramatic form in theater contexts, personal storytelling and creative non-fiction, and hybrid approaches to reporting in popular media. 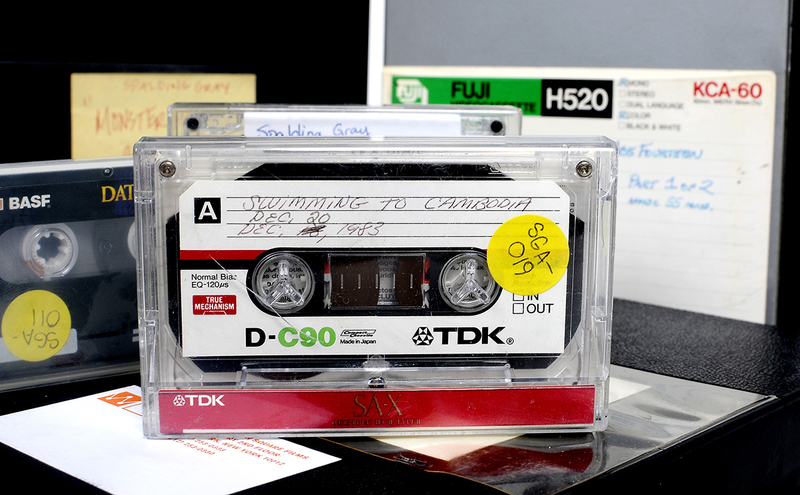 Image: Audio cassette and video cassette tapes from the Spalding Gray archive. The archive contains more than 150 audio tapes and more than 120 VHS tapes. Photo by Anthony Maddaloni.